Odisha - 768 001, India. Hotel Sheela Towers is an elegant hotel located in the heart of Sambalpur city. Sambalpur represent many things to many people. we offer a number of services and amenities designed to please business travelers, families and romantic couples. We have always been dedicated and given our best so that you return satisfied. We invite you to explore our site and take delight in what we offer. 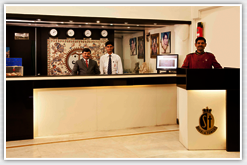 It is our special wish that when you visit Sambalpur, You stay with us. Hotel Sheela Towers © 2012, All rights reserved.